The true to size Alexis clog is extremely lightweight and flexible. Waterproof, easily washable. 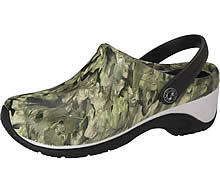 Clog design made with lightweight DBL materials that contours to the foot. Gel insole with cup and arch support doubles the comfort. Exclusive crown arch provides exceptional mid foot support. Absorbs shock and helps to reduce heel impact. Specially designed tread pattern improves traction. 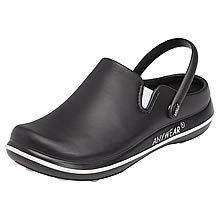 The back strap swivels so you can wear it up or as a traditional clog. Is washable using cool to warm water. This clog has been discontinued from the manufacturer. They only purchase or make several thousand and when they are gone, they're gone! Even when they are the best sellers. Not sure why they do this with there footwear. Low Heel Height - Heel Height 1"